That early-October 2017 quote from Mike Babcock after an 8-5 win over the Rangers certainly applied last night as the Toronto Maple Leafs held on to win a messy back-and-forth tilt with the Ottawa Senators on Wednesday night. 1. A showdown between the league-worst Senators and the high-octane Maple Leafs? This provincial mismatch set the stage for the opening ten minutes of the game as Toronto dominated the flow of play. Possession time and shot attempts were heavily in favour of the Leafs, culminating in a beautiful Mitch Marner pass off the rush for a tap in by a streaking Hyman. Unfortunately, Toronto was guilty of taking their foot off the pedal for long stretches at a time afterward, allowing the Senators to come back, take the lead, and then battle back into the game after it was 4-2 Toronto due to some disengaged, defensively-switched-off, undetailed periods of play from the Leafs. The Ducks win was a step in the right direction, but the Leafs still need to figure out how to dispose of tepid opposition like this in a business-like fashion. The Senators were the harder-working side — they carried nearly 60% of the scoring chances and high-danger chances — but up against this Leafs team, they just ran out of talent over the 60 minutes. 2. The Senators came on strong in the second half of the first period and scored their first of the night on a rush up the middle by Magnus Paajarvi. Some non-existent gap control by the Gardiner-Zaitsev pairing — not unlike the 3-1 goal against Anaheim — left far too much open ice for the Senators forward to take a pass and head straight to the net. Early in the second, Gardiner threw an ill-advised backhanded pass (clearing attempt?) along the boards that was intercepted by Ryan Dzingel. Dzingel’s shot attempt ricocheted off of Zaitsev’s face directly to Matt Duchene, who made no mistake in putting Ottawa ahead 2-1. It was a rough night for the Gardiner-Zaitsev pairing, to say the least. It is a combination that has had some success when deployed with favourable offensive-zone starts. However, they can be an adventure in their own end and it’s often not as smooth coming out of the Leafs’ end with this pairing on the ice. This pairing was on for 8 of Ottawa’s 15 high-danger chances in the game. Gardiner typically nets out positively from his high-risk, high-reward style of play, so you can live with the occasional glaring giveaway or defensive slip up, but this season, when on the ice with Zaitsev, the pairing is not breaking even on shot attempts, shots, or goals share at 5v5. This pairing has been a mainstay more due to a lack of better options than its effectiveness as a duo. At this point, Zaitsev appears to be at best a “defensive defenseman” who can penalty kill but needs to be sheltered from quality competition. 3. Thankfully, the addition of Jake Muzzin gives them some viable options that they simply didn’t have in 2017-18. Thus far, the Muzzin-Rielly combination appears to be a legitimate all-situations top pairing. The Dermott-Hainsey pairing has looked fantastic, finishing the game as the leading pair in terms of shot share. We’ve also seen Babcock recently deploy a Gardiner-Demott duo in offensive situations with some success. So, what’s the best option for the Leafs if no further changes are made to the blueline? You could utilize Dermott-Hainsey more often as your second pairing of choice, but Dermott only played one shift in the final 10 or so minutes last night and does not seem to Babcock’s full trust yet. You wonder if Babcock at least tries Gardiner – Hainsey / Dermott – Zaitsev to see how that looks ahead of the playoffs. It risks going from two working pairings to one, but the goal is to have three pairs working for the postseason. 4. On Muzzin himself: another solid showing from the Leafs newest acquisition. He had a couple big blocks in this game including one diving effort partway through the second as Toronto was struggling to find its legs. Muzzin checks a bunch of boxes that the Leafs were missing: physical play, a big point shot, and an absolutely epic chin curtain. Most importantly, he provides a reliable defensive effort on a nightly basis, whether it be by blocking shots, boxing out/tying up, or his ability to win puck battles. According to data tracked by The Point, Muzzin sits second league-wide in puck battles won/game behind only Mark Giordano in that respect. It’s not surprising if you watch him closely throughout a game. 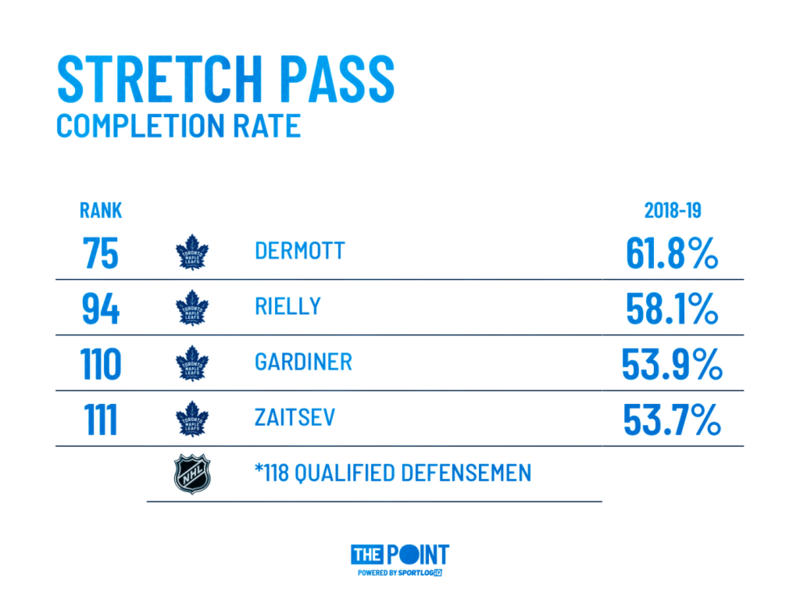 The Leafs really addressed a glaring need head on here as far as a defenseman who can bust up cycles and transition the puck. 5. William Nylander continued his strong play of late with his performance in this game. He hit the ice with the poise that characterizes his game when he’s “on”, feeding Kadri seven minutes into the first for what would have been a tap-in if it weren’t for some Craig Anderson acrobatics. When Nylander is at his best he controls the pace of play while maintaining possession with slippery-smooth edgework and deceptive strength on the puck. He had quite a few of these moments tonight that typically conclude with a perfect dish to the open man. He really appears to have turned the corner. 6. Despite their lackadaisical finish to the first/start of the second, the Leafs showed why they are so dangerous — and able to win with partial efforts thanks to the presence of stars and difference makers up and down the linieup — with three goals in exactly four minutes near the end of the second. Toronto’s surge started with Andreas Johnsson cleaning up a Ceci giveaway in front of the net to extend his recent hot streak. That earned him a promotion to the Kadri line in the third period. In his rookie season, Johnsson is pacing for a 23-goal, 47-point season in under 13 minutes of average ice time. His P/60 of 2.47 at even strength puts him fourth on the team behind Tavares, Marner and Matthews. Johnsson deserves a permanent spot in the top nine and it’s hard to argue it shouldn’t come at the expense of Connor Brown. That said, Brown has formed an effective trio with Kadri and Nylander in recent games. It will be interesting to see where Babcock eventually lands on this lineup decision. Based on his quotes yesterday, he’s not totally sure what the right answer is here yet. Good problems to have. 7. The go-ahead goal was a fantastic solo-effort by Auston Matthews and a timely reminder of Leafs fans are fortunate to have him locked into the franchise’s foreseeable future. He picked the pocket of an Ottawa player in the neutral zone and headed straight for the slot. A toe drag and puck recovery later, he was roofing it over Anderson to give Toronto full momentum. When he has a head of steam, the ice tilts and the puck just sticks to him thanks to that rare combination of the power, reach, and elite puck skills. Matthews is most dominant when he is fully engaged away from the puck via dogged puck pursuit and sneaky stick lifts that help the Leafs transition back onto offense. A key to the growth of his game will be getting to this level of engagement on a consistent basis. 8. Thankfully, he has one of the best in the game to learn about consistency from in John Tavares. Tavares put the Leafs up 4-2 off yet another beautiful play orchestrated by Mitch Marner. The narrative that his success this year has been dependent on Marner is grossly underselling the impact that Tavares has had himself. The duo has been lethal due to a mutually beneficial relationship as Tavares opens up so much space for Marner to go to work. For what it’s worth, Tavares has been the most consistent Leaf on a night-in, night-out basis this campaign, generating shots in the slot at a rate only surpassed by Nathan MacKinnon. 9. Unfortunately, the Leafs allowed the Senators right back into it with a sloppy start to the third and a couple of quick goals. Once again, Toronto responded with a goal off the rush. A fantastic sequence lead by Rielly culminated in the blueliner’s 14th goal of the season, setting a career high in points with 53 with 29 games remaining. The Norris-calibre dream season continues for Rielly with some lofty Toronto records firmly in his sights. The game-winning goal sequence was similar to a number that we’ve seen from Rielly this season — starts it off with a good defensive play, explodes up the ice the other way, and then finishes off the play at the other end. 10. I won’t get into any contract talk, because there’s more than enough of that these days, including a ton of fantastic analysis of the Matthews contract with all its exciting and terrifying implications. Inevitably, the MSM will now turn its focus to the Marner contract in their never-ending quest to raise the collective blood pressure of Leafs Nation. I would encourage our readers to rise above this noise and try to enjoy this Leafs team for what it is the rest of the season – one of the very best collections of elite talent that most of us will see in our lifetimes as fans of this franchise. They won’t be perfect. They won’t always dominate the teams that they should. They will have their ups and downs just like any other “good” team in the NHL. They will win games that aren’t quite masterpieces (like last night) purely based on their skill. Ultimately, their legacy as a team will be determined by their success in the postseason. But as of today, for all their perceived warts and shortcomings, they are fourth place in the NHL, and it’s easy to forget that they’re only going to get better. In Matthews and Marner the Leafs have two budding superstars with yet unrealized upside. Perhaps more importantly, they have two young players that are wholly dedicated to improving their game and bringing a championship to this city. Professional sports is rife with empty platitudes and lip service, but these kids are genuine when they state their desire to win here in Toronto and their appreciation of the fans in this city. Admittedly, there’s some interaction-influenced bias on my part (pictured below), but I have no doubt they will be here for as long as this city will have them. Mike Babcock addressed the media after his team’s 5-4 win over the Ottawa Senators on Wednesday night, the Leafs’ fourth win in their last five games (4-0-1). Probably turnovers. The bottom line is I thought we were really ready to play. I thought we started and I thought we were playing well, and then we got careless and we never really seemed to be able to get it back. At the same time, when you are a good teams and you win games, sometimes they are not very pretty, but you still won them. At the end, when we get up tomorrow and look at the standings, it is going to look pretty good. I thought he played hard and did a good job. He plays hard most of the time. It’s nice to see when guys get rewarded. I thought Goat’s line was real good tonight, too. Little John got us going in the second there when the wheels came off. I thought that was good. I mean, Freddy, at one point there, had to make a few saves in a row. We found a way to win a game. I didn’t think… I thought we started great. I thought we were organized. I thought we looked good. And then, in the end, we weren’t as good as we wanted to be. But I think suddenly now we’ve got points in five straight and seem to be going in the right direction. When you start making the save when you are laying on your back and the puck is behind the net, it is probably going to be ugly, but he kept it out, so good for him.